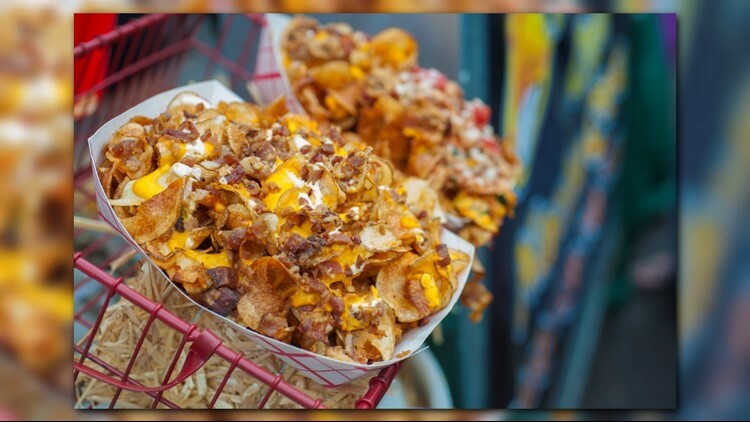 Everything you need to know for this year's A Taste of Colorado at Civic Center Park. DENVER — One of Denver’s largest Labor Day Weekend events is kicking off Saturday, September 1 at Civic Center Park. 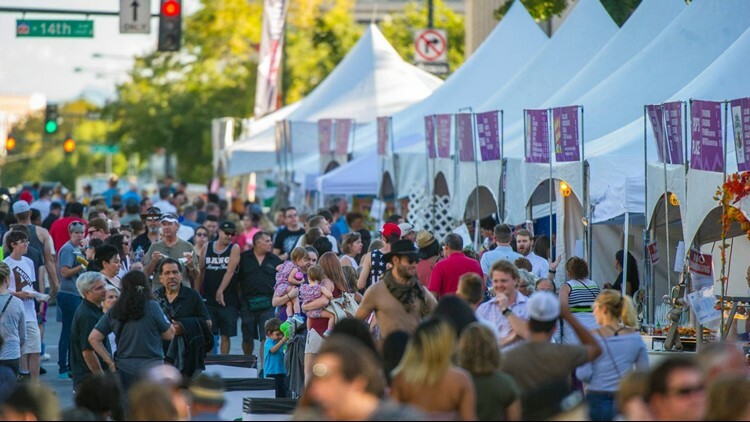 Over 500,000 people are expected to attend A Taste of Colorado – a three-day festival filled with music, food, shopping, and an overall good time. You probably already know that the event is free to attend, but if you want to try out the food or get a beverage, you’ll need to buy tickets at one of the many booths inside the festival. Since navigating the event can be overwhelming, we put together this handy guide to help you get started. One the major draws of Taste of Colorado is the variety of free musical acts who perform throughout the weekend. Four stages will feature dozens of musical acts from a variety of genres – so everyone should be able to find something they like. 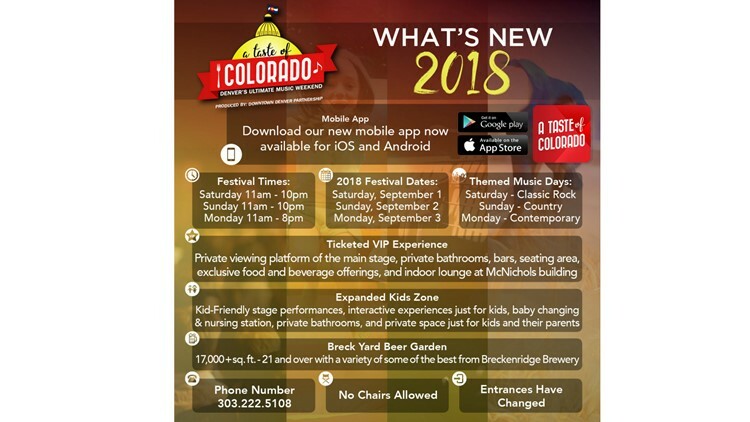 While admission to Taste of Colorado is free, VIP tickets are available for those who want a more exclusive festival experience. Those with tickets will be able to watch all of the concerts from a private up-close VIP area. 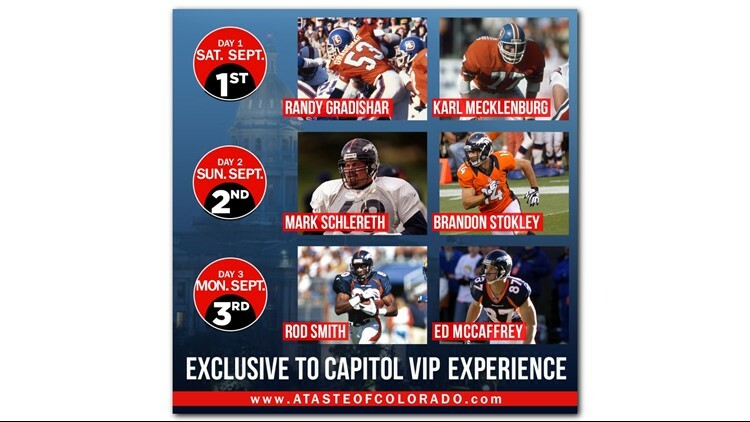 Plus, each day ticket-holders will have the opportunity to meet a few Broncos legends. There is also an exclusive lounge with private indoor bathrooms, food and two free drinks for each person with a VIP ticket. Anyone spending a day at A Taste of Colorado would be remiss not to try the food. More than 50 local food trucks and restaurants will be offering up tasty dishes from small plates to full meals. You can also take your pick from a selection of beer, wine and cocktails that’ll be sold at the park. Tickets are sold in strips of 15 and cost $10. More than 175 booths will be set up at Civic Center – creating an arts & crafts marketplace where shoppers can browse everything from homemade crafts and gifts to jewelry and special products made by Colorado artisans. Those looking to knock out some holiday shopping ahead will have no shortage of options. Known as a family-friendly event, it’s fitting that there would be activities for kids to enjoy during the festival. Enter the KidZone, a designated area offering free activities for children. This includes crafts, magicians, a music sound station and comedy. There will also be special kid-friendly food vendors. With an event of this scale, it makes sense that crews would need to close a few roads to prepare for the influx of people packing the park. Organizers put together a schedule of street closures and detours. All streets are expected to reopen by 6 a.m. Tuesday. For additional tips on getting to Civic Center Park, visit: https://bit.ly/2LkjZVD.